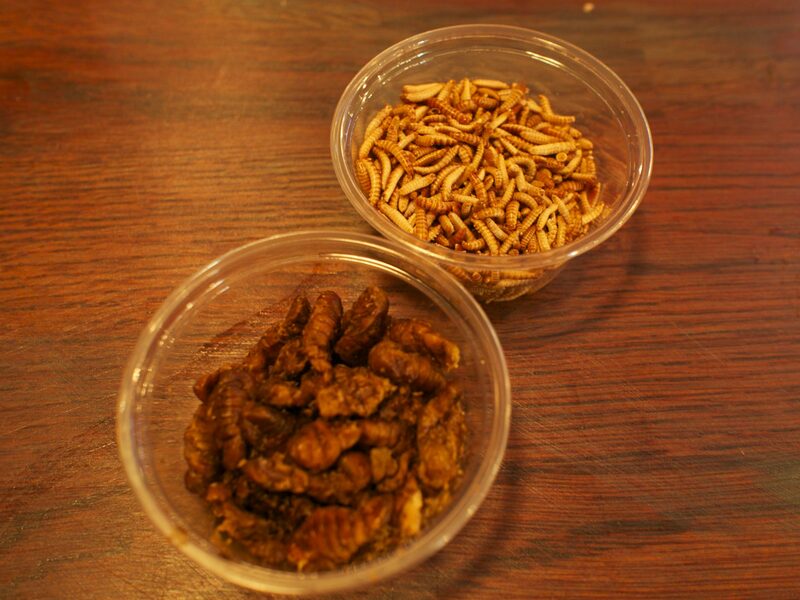 Most people’s idea of a fun night out don’t include eating dried silkworms and mealworms. Toon Lunch Club is always up for a challenge though so when Thaikhun invited us to come and sample some creepy crawlies along with some Thai street food at their Metrocentre restaurant we jumped at the chance. 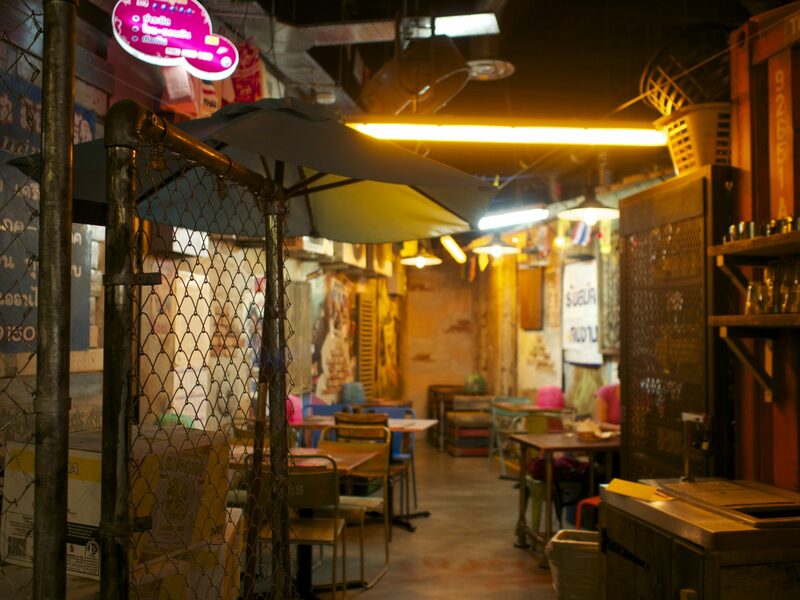 Walking into Thaikhun you are transported to the streets of Bangkok – there is stuff everywhere you look. Neon signs, bikes, flags, radios, crates…. Aside from the Five Guys signage out the window it would be easy to forget you’re in the middle of a shopping mall. 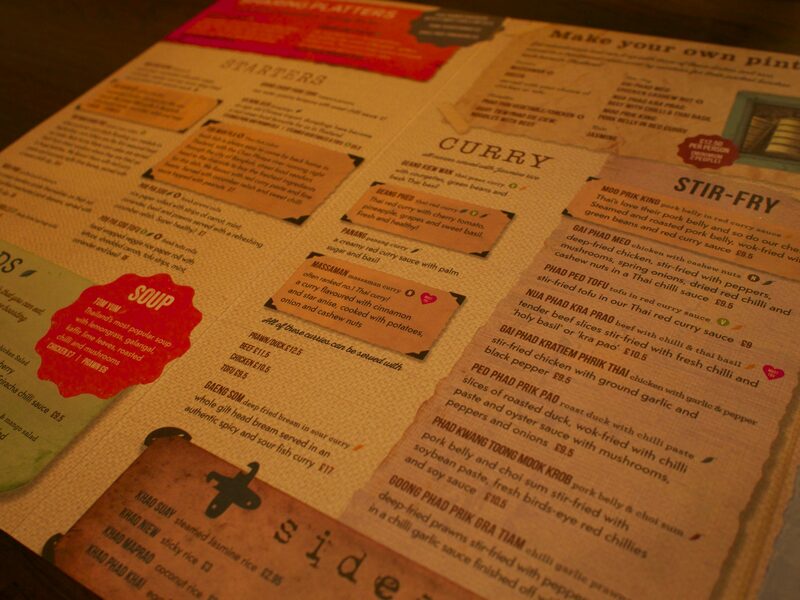 We perused the extensive menu with help from Mimi, one of the knowledgeable and friendly staff members. They end each conversation with the word ‘khun’ which means ‘you’ and is their way of welcoming you to the Thaikhun family. I decided to try the steamed pork and prawn dumplings (£6.50) and SK – my date for the night – went for marinated chicken skewers with satay sauce, cucumber relish and toast (8 for £11 – you can also get 4 for £8). While we waited we were offered some prawn crackers and drinks – a bottle of Singha beer for me and SK had a Big 5 smoothie. 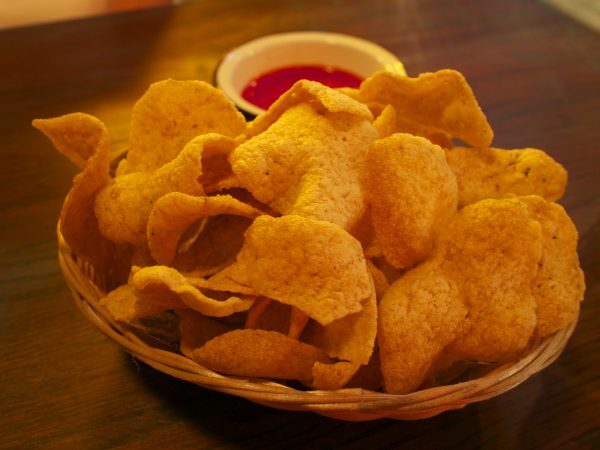 The prawn crackers were crunchy, slightly spicy and came with a sweet chilli dip – they were so moreish we had to stop ourselves from scoffing the lot. From our booth we had a great view of the open kitchen with chefs hard at work. Not quite the same as watching a master Thai street vendor at work but pretty close! 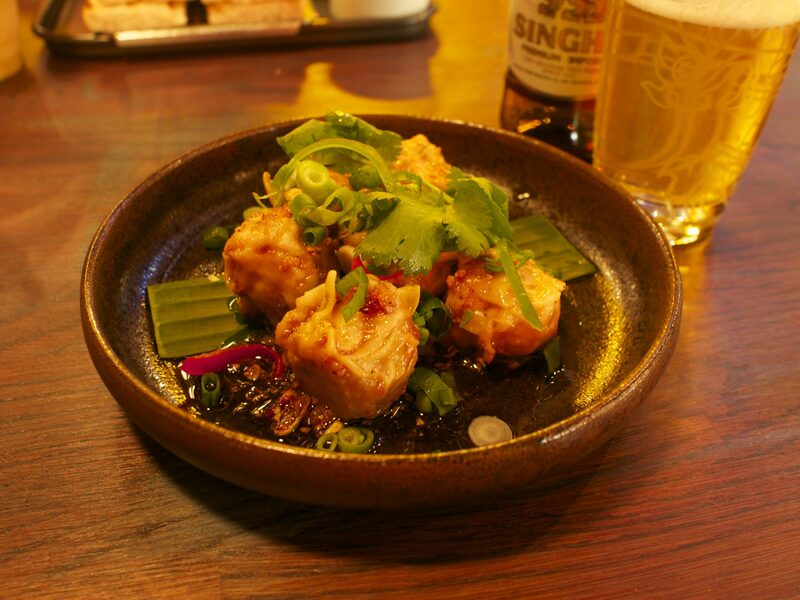 The steamed pork & prawn dumplings were succulent, tasting mostly of pork with a light batter, sweet soy sauce, spring onions and coriander garnish. SK’S chicken satay was one of the best I’ve tasted in this country. A dish that originates in Indonesia, my favourite place to eat satay is always from my family’s local Indonesian Restaurant in Holland. As a former colony, the Dutch have excellent Indonesian restaurants and I struggle to find any that compare in this country. 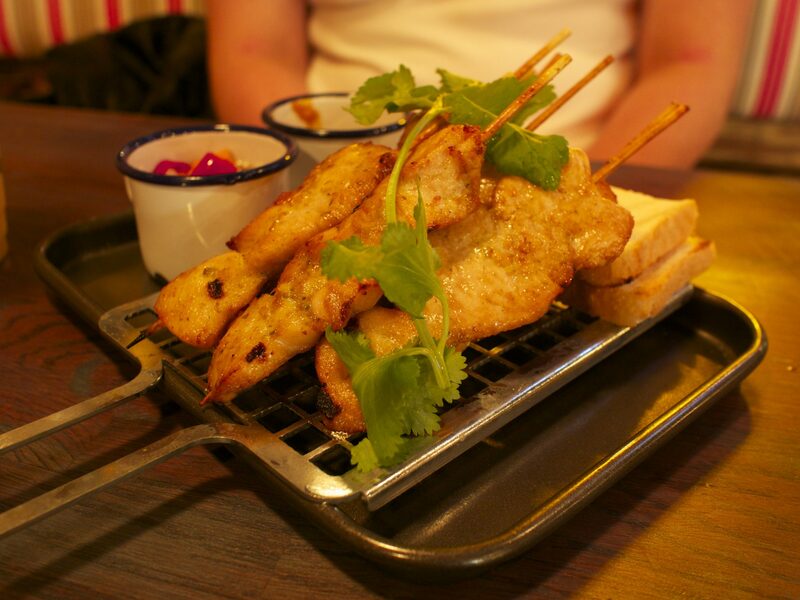 Thaikhun served the marinated chicken skewers with a thick peanut sauce containing a hint of spice and chunks of peanut in it and a cucumber relish which added crunch and heat. 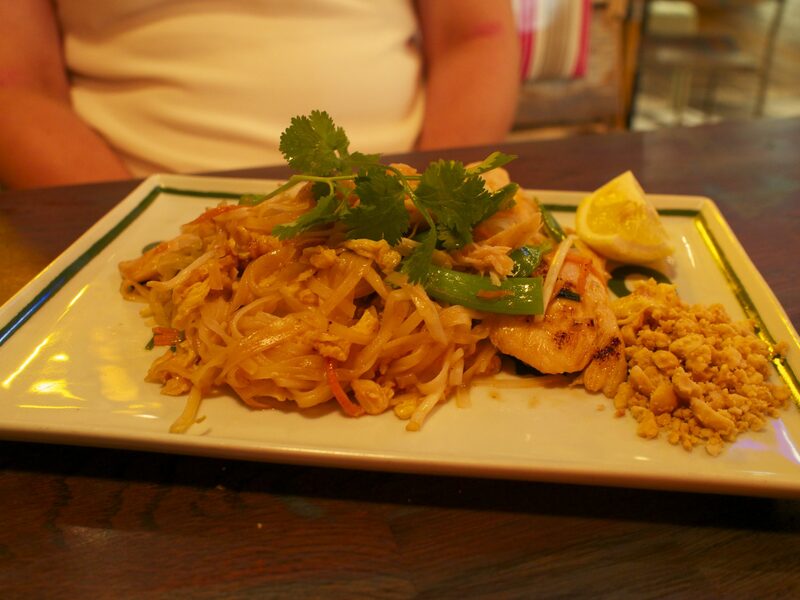 Mimi told us that Thai food shouldn’t be too spicy, just nicely balanced so that you want to eat it all and we did! At this point in the meal SK brought up the ‘bar snacks’ we’d seen when we walked in. “What are they?” She enquired and were told they were in fact dried insects. Taking a swig of my beer I took the dare that SK laid before me and asked to try some. On the streets of Thailand you can eat live insects, apparently they’re a delicacy. I don’t think I’m quite ready for that yet! Our mains promptly arrived, filling the air with more fragrant aromas. I had plumped for Prawn Massaman (£12.50), one of Thailand’s most popular curries which is flavoured with cinnamon and star anise and cooked with potatoes and cashews. 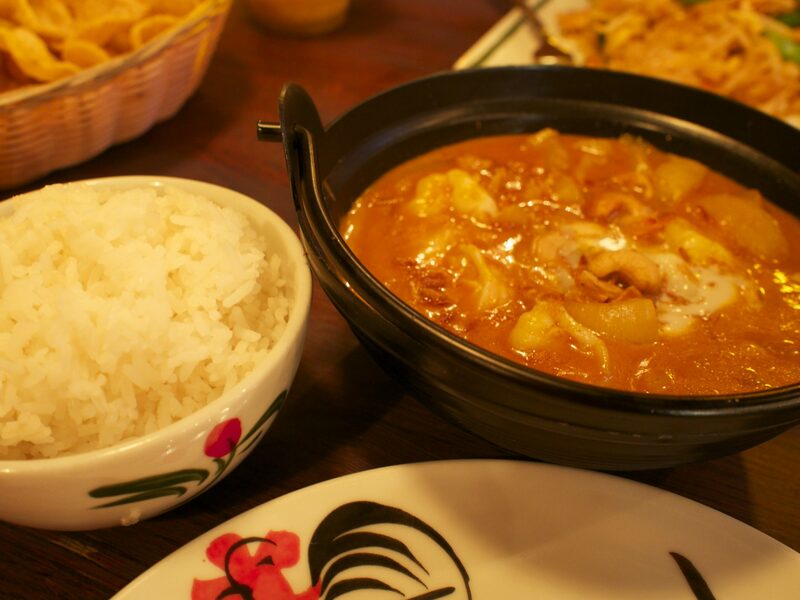 Thais will tell you that all their food should have a balance of four flavours – sweet, salty, sour and spicy. The curry possessed all of these qualities and they weren’t fighting for attention, they were perfectly balanced. I was please that the curry contained massive juicy King prawns which were butterflied and tasted delicious. My only criticism would be that the potatoes in the curry could’ve been cooked just a little longer as they had a bit too much bite to them but overall it was a great dish which I would order again. It came with sticky rice on the side, and overall the portion was very generous – I couldn’t finish it! SK had decided to try Pad Thai (from £9.50) for the first time and on my recommendation asked for chicken and prawns (which can be added as a side, it’s usually one or the other). The best place I’ve tasted Pad Thai in the North East so far is Zen in Durham but Thaikhun definitely gives them a run for their money. The dish is made up of rice noodles which are stir fried with egg, carrots, bean sprouts, spring onions with a sweet & sour tamarind sauce and peanuts on the side. SK was in noodle heaven. Onto the desserts, which we just about had room for. 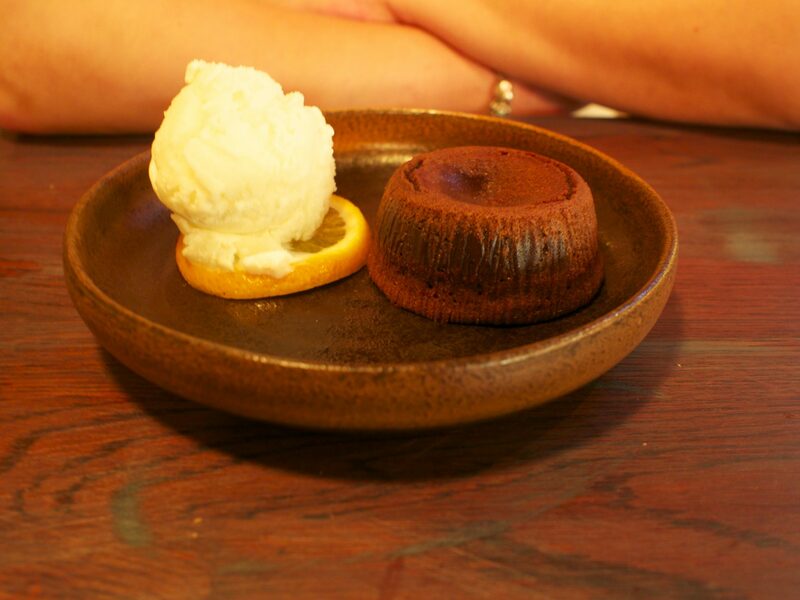 SK liked the sound of Thai Bounty – chocolate fondant with coconut ice-cream (£5.25). I decided to try matcha tea & chocolate chilli ice-cream (£4.50). The chocolate fondant was a delight with SK digging her spoon into the chocolate cake dome to reveal a warm chocolate sauce and the coconut ice-cream complimented it perfectly. My ice-cream was refreshingly different, with strong matcha flavours and chocolate with a subtle hint of chilli. 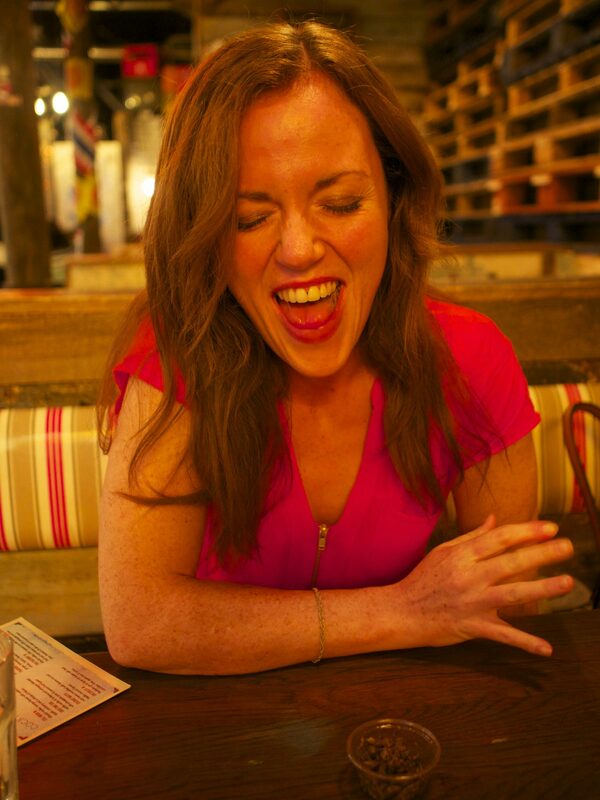 Thaikhun is the place to go if you want a fun meal out. We headed to the cinema afterwards which was ideal as it is just across from the Odeon. Perfect for post-shopping nibbles or pre-cinema nosh. We’ll be back! 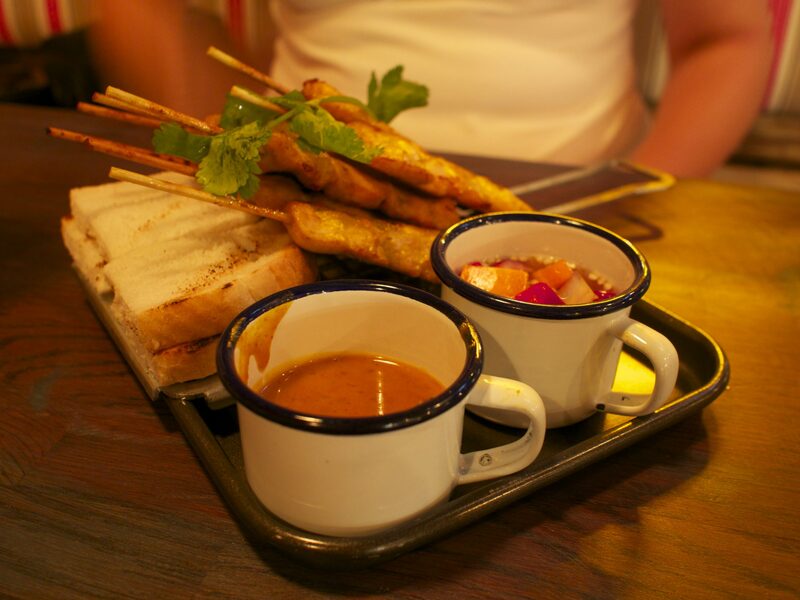 Do you want to win a meal for 2 at Thaikhun? 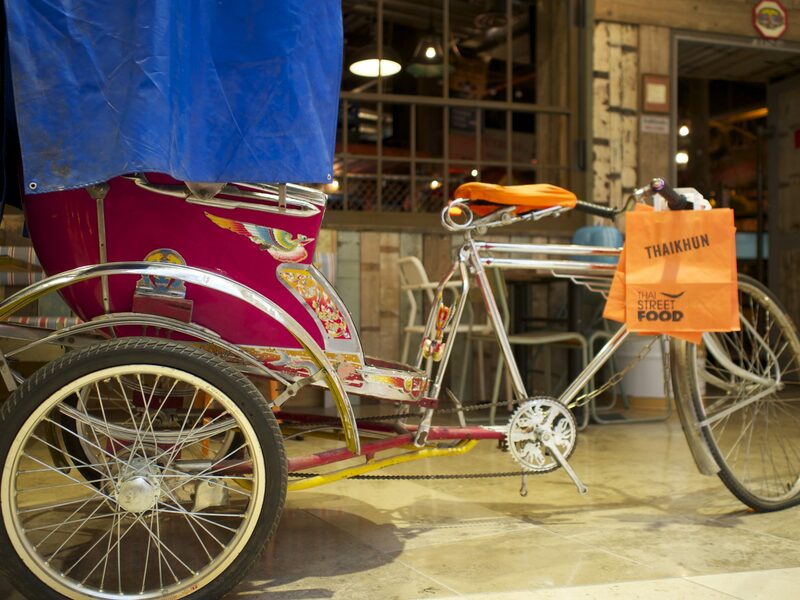 We are pleased to be able to offer a free meal for two at your nearest Thaikhun. All you have to do is head over to Twitter or Instagram and follow both @Toonlunchclub and @FollowThaikhun (@Thaikhun and @Toonlunchclub on Instagram). If you want to share this blog post too that would be appreciated. Good luck! T&C – voucher will be valid for a meal for two up to the value of £40, Thaikhun has restaurants in Manchester, Aberdeen, Oxford, Cambridge, Glasgow, Nottingham, Metrocentre & Guildford. Table must be booked in advance through Thaikhun. UK entrants only. Winner will be selected at random and announced on Friday 9th September 2016 at 5pm via social media. 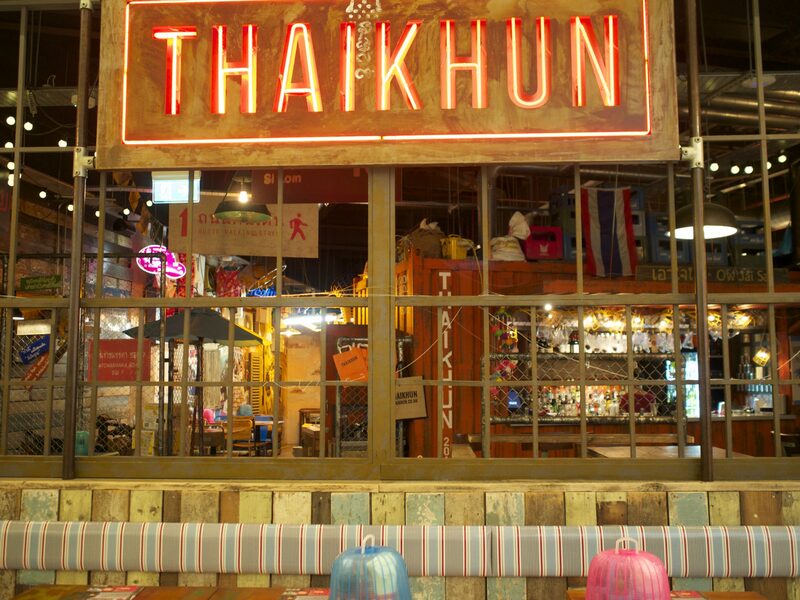 Thaikhun is located in intu Metrocentre, Garden Dr, Metrocentre, Gateshead NE11 9YG.